Set against the backdrop of present-day Stockholm, BLACK WIDOW is a dark thriller that takes place in a city where no-one can be trusted. Ever since a witness to a crime committed suicide right in front of him, Jakob Khalil has been wracked with guilt. His colleagues at the City Police in turn seem reluctant to trust him fully after the incident. Taking on a new case, the murder of a top tier professional footballer, the solution seems obvious at first: the only two people present during the murder were the victim and his pregnant wife. Soon she’s on all the headlines and the court of public opinion, as well as Jakob’s colleagues, are all sure of the verdict. Guilty. But Jakob isn’t convinced. 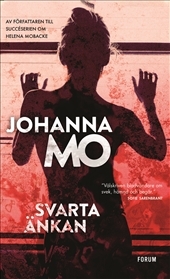 When other murders occur, Jakob is alone in suspecting a serial killer is roaming Stockholm. But what could be the motive? Time is running out as Jakob frantically tries to follow the conflicting leads, and still nobody but him believes the serial killer theory. In his pursuit for evidence, he sets events in motion that might cost him everything, a dangerous gamble with lives at stake.